The University of the Philippines Academic League of Chemical Engineering Students (UP ALCHEMES) proudly brings to you Research Fair 2013, Re-Volt! : Redefine the Norm Through Scientific Pursuit of the Filipino Youth. This February 7-9, workshops, seminars and the much awaited Research Competition is in store for the representative students of over 40 schools from across the Philippines. The Research Fair is an annual competition and workshop organized by UP ALCHEMES. Now on its 12th year, the Research Fair continues to recognize young minds and breakthroughs in Science and Technology, which are relevant to society, environment, and economy. This event is established to impart the organization’s core value of persistent academic excellence, as fresh high school minds are driven to pursue their curiosities in the sciences, and expose their ideas to society. 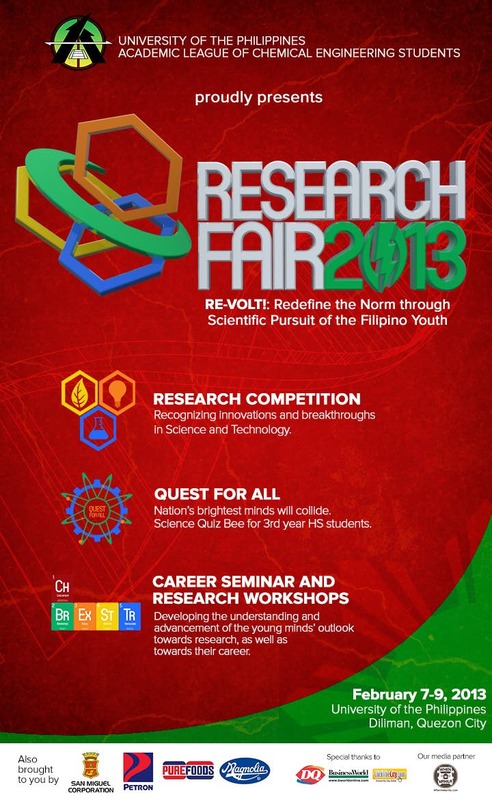 The past year has been successful as Research Fair 2012 has acknowledged young ideas even beyond NCR and Luzon. 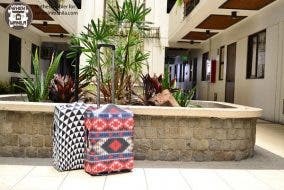 An overwhelming number of 127 research entries graced the event, with participating schools from as far as the islands of Mindanao. This academic year, the 12th Research Fair has surpassed this figure, setting another milestone in touching lives throughout the Philippines.